Minimum damages that do not need to be fixed immediately will be charged 30 EURO polishing fee. The damages must be smaller than 1 cm. For example light scratches and natural deterioration due to wear. 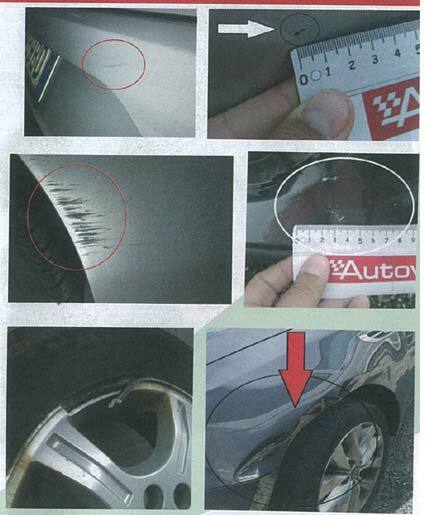 Scratches and dents on bodywork, rims between 1 cm and 10 cm of lenght will be charged with half excess. Scratches and dents, exceeding 10 cm of lenght, will be considered and charged as serious damages. Tires: any anomaly will be charged fully. Non-stop assistance is available in the European Union. This includes on-site error detection and, where possible, resolution of the problem (typically discharged battery, tyre damage). If repairs are not possible on site, the service is part of the car's carriage to the nearest service. If the car can not be repaired within 24 hours of service, a car with the same category for 3 days can be requested. The cars have casco insurance, that is valid in the European Union. The amount of the insurance damages 90% of the damage, that is, the amount of the allowance to be paid by the client is the remaining 10% of the total amount of damage, but at least 100.000 HUF. This means that in the case of a fault of self-worth, 10% of the damages you have to pay but a minimum of 100,000 HUF against the account for GAME. In addition, a claim document must be completed and a copy of the personal documents (passport or identity card) and the driving license must be attached. If any of these are missing, casco insurance is not valid, the customer must fully compensated for the damage caused. The exclusion factor for casco insurance is also a serious violation of the drinking / boring condition, expired driving license or hard traffic rules foul. For an extra charge, the Customer can apply for self-help supplement insurance besides the car rental service. In the event of this purchase, the customer will be relieved of the casco insurance coverage once for each lease. The fee will be charged on a rent per day at the beginning of the rental. If the failure results from a customer fault, negligence (eg, fuel refueling, lock-in key, etc. ), an assistance service is available, but all repair and assistance costs are payable, the customer must arrange the costs to the local service provider on site. If the failure can not be related to a customer, the assistance service can be used free of charge, and the repair costs are not borne by the customer. Assistance service is available. The service is part of the car's carriage to the nearest service, and a 3-day car-to-car exchange can be requested. If the accident is due to the customer's fault or negligence, all assistance costs are subject to payment. In addition, the damaged car is repaired under the terms of the casco insurance. If the customer is accused of casualty in the accident, all assistance and repair costs are charged to the liability of the offender. At the same time, it may be that the customer has to arrange the cost to the local service provider. These costs will then be reimbursed to the customer by the insurer of the wrongful party during the damages. In all cases, police reports are required. The customer has to compensate for the damage caused by the casco insurance. If, during the police investigation, the perpetrator is circumvented, the amount of compensation paid may be claimed by the client from the perpetrator. Assistance can also be used in this case, but the customer must arrange the costs for the local service provider on site. However, if the perpetrator is circumvented, compensation can be claimed from the accounts. In this case, the GAME must be requested to deliver the spare key to the scene and the vehicle must be handed over to GAME immediatels on site. The expected cost and the date of arrival of the spare key depends on the distance from the car to Budapest, which GAME always provides in advance, in writing. All cost must also be settled by the Customer. Of course, a replecament car is also available from GAME, which will be delivered to the specified address with the spare key. In this case, an assistance service is also available, but the customer must arrange the costs for the local service provider on site. If the car can not be opened with the help of a mechanic, the GAME must also be requested to deliver the spare key to the scene. All costs must also be settled by the customer. The expected cost and the date of arrival of the spare key depends on the distance from the car to Budapest, which GAME always provides in advance, in writing. In this case, the assistance service is also available, but the customer must arrange the costs for the local service provider on site. If the tire / wheel can not be repaired, the cost of replacing the tire / wheel of the same size and make of the type will also be borne by the customer. In this case, an assistance service is also available, but the customer must arrange the costs for the local service provider on site. The deposit is 500 Euro, must be locked by card. Cash deposit not acceptable. This is not a payment, this is a frozen amount. After rent, the deposit will be unlocked. The normal unlocking process is between 5-10 days. Unlimited mileage is included in rental fee. The minimum driver age is 19. Allowed countries to drive: EU countries + Bosnia + Serbia + Montenegro + Macedonia + Albania. The board pass is only 20 Euro for the whole rental period. Not per day, totally is 20 Euro. The second driver is allowed, this is only 10 Euro as well. The motorway ticket / toll pass is not included in the rental fee. You can buy it in my office, the price is the same than in official price. You can buy for other countries yourself, close to the border in any gas stations. The insurance with 10% minimum 300 Euro excess is included in the rental fee. If you need zero excess insurance, this is possible. The prices is 25 Euro / day, hosted by Allianz insurance company. My office is next to the airport. I have free shuttle service frome the airport, hosted by the offical airport taxi company, called "Fotaxi". Please go outside from the terminal, and on the left hand, there will be the taxi desk. Please tell your name to the taxi operator, and a taxi will pick you up and delivery to my office. There is possibility to pick the car up other places. In Budapest, the delivery fee is 30 Eur, other places for request. Child seat, snow chain, and gps available to rent, the price is 2 Euros per day. We have many child seats for kids between 0 to 8 years. The winter tyre is necessary beetween 15th of october and 15th of march. Snow chain is necessary in same period in Austria. My company has 0-24h, non stop service. However, from 8pm to 6 am, the Customer has to pay extra 20 Euro meet late fee. In my fleet there are around 150 cars. The average age is 1 year, the average mileage is less than 50000 km. In my fleet no car with more than 120.000 km and no older car than 2 years. Within 24 hours of returning the rental car, the representative of GAME Rentacar Ltd. had given a written notice to the bank of the release of the deposit. The effective termination of the deposit is subject to communication between the Customer’s bank and the bank of GAME Rentacar Ltd. The offical termination date may be between 1 and 30 working days due to bank transaction, but the average is 5-7 days. GAME Rentacar Ltd. has no influence about the unlocking time.